This month sees two events marking the end of an era, as the existing Mearns Academy in Laurencekirk closes after 119 years of community service. 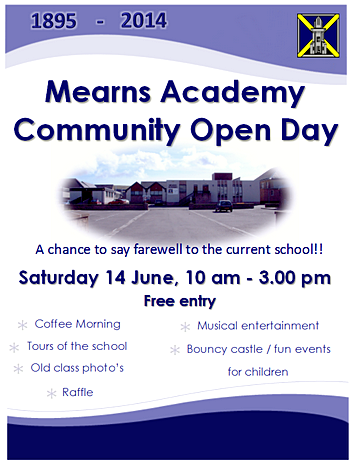 The first event, this Saturday 14th, is an open day for the whole community, giving everyone a chance to take a last look around the school before the doors close for good on 2nd July. The open day will be a mix of entertainment and reminiscing, with old class photos on display, music, a coffee morning, school tours, a bouncy castle and more. 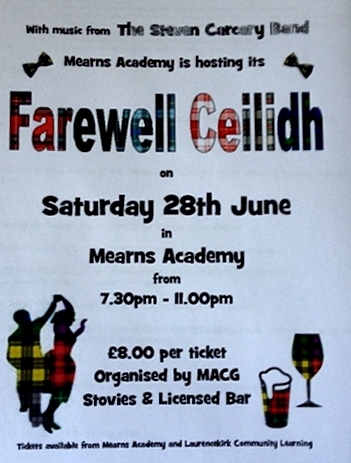 Then, on 28th June, the old Academy will get a great send-off with a Farewell Ceilidh. Organisers hope that lots of former pupils and staff will come along and enjoy a great night with live music, stovies and a licensed bar. The ceilidh is open to anyone, and tickets can be bought at Mearns Community centre or the Academy. Come along and enjoy the celebrations and memories!